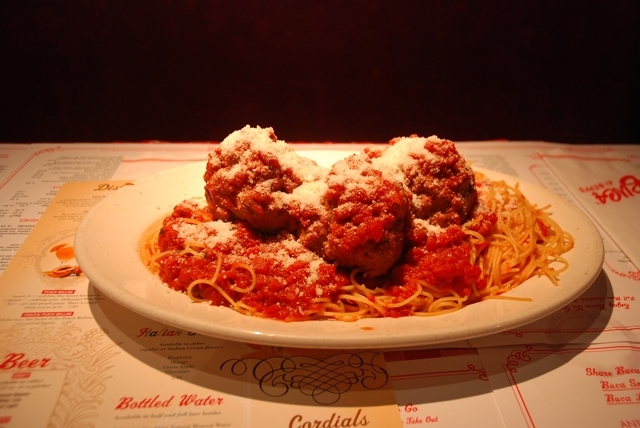 Can there be anything more American than the classic Spaghetti and Meatball dinner? I know the style is actually Italian, but it seems so ubiquitous in American households that it appears that we've adopted it wholeheartedly. When I was growing up, the pasta meal at our house was actually "American Chop Suey," which was some shaped pasta (my mother like seashell pasta) to which was added some tomato sauce and cooked, with meatballs as an afterthought. When my mother served actual spaghetti, she usually broke the pasta in half to have it fit better in the pot. It wasn't a gourmet meal by any stretch of the imagination. My parents took in foster children, and a teenager named Pam introduced us (actually me) to "real" Italian cooking. I had my first good pasta and meat balls, and I watched carefully as she prepared it. After she left, I started making it on my own, refining my technique, and then another Italian teenager named Jackie gave me further insights on seasoning as well. My wife, who had Italian ancestors, likes my sauce, but prefers her own style of meat balls. Until I had pasta at her house, I always cooked my meat balls by sauteing them in a frying pan before adding them to the sauce. Sandra's family, on the other hand, put the raw meat balls into the sauce and let the sauce cook them, and that's the way she likes them. So, for this one dish, Sandra and I share the duties; I cook the sauce while she makes the meat balls, and then we add them directly to the sauce. The only disadvantage I see to using the raw meat balls rather than cooked is that occasionally, the raw ones "disintegrate" into the sauce, making the resulting sauce meatier. Sandra's family also turned me on to brachiole. This is a flank steak, pounded thin, to which spices, cheese, and hard-boiled eggs are added which is then rolled and fastened by toothpicks and plunged into the sauce. After cooking, the brachiole is sliced into pinwheels and served alongside the meat balls. Sandra is quite good at making this. I've had a version of this at a place in Reading, MA called Kitty's, and the big difference there is that Kitty's uses about five times as much garlic as Sandra does, resulting in a garlic flavor bomb that is out of this world. (I've tried adding more garlic to Sandra's brachiole, but she prefers the more mild-tempered version she's always made.) I've also had brachiole locally in Salem, NH at Polcari's and the Colosseum restaurants, but neither one was as good or memorable as Kitty's or Sandra's. I make a variation of my sauce using ground beef where I saute the beef and add spices and tomato sauce--meat sauce. Sometimes, I vary that recipe using cubes of steak and occasionally add diced carrots and celery to make a faux-bolognese sauce. It's an easy and quick meal to make on workdays, and goes good with any kind of pasta, including Sandra's favorite, ravioli. I don't measure ingredients when I make a tomato sauce. Instead, I just add judicious amounts of fried garlic, minced onions, salt, pepper, oregano, parsley, and (one of my favorite spices) basil. I then let the spices mingle into the sauce, and then taste it, correcting the seasonings as necessary to get the "right" taste. For tomatoes, I tend to use 28 oz cans of crushed tomatoes, some red wine and water, and a 6 oz can of tomato paste (one can of paste to one can of tomatoes). Occasionally, I will add a beef bouillon cube to the sauce for a "meatier" taste, especially when I'm making a meat sauce (bacon bits are also a nice touch, giving the resulting sauce a smokier taste).